A Quote: "Keep love in your heart. A life without it is like a sunless garden when the flowers are dead." 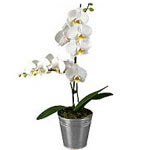 Product description: Make someone special happy with these wonderful natures bloom. 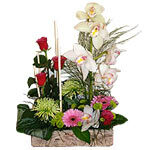 Such a expressive arrangement of mixed flower like roses, orchids, gerberas and chrysanthemum set in a pot of stone. The croton plants spike-like flower is insignificant at best, but oh, those leaves! 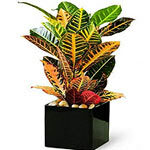 Thick, elongated leaves display tropical colors with contrasting veins. Vivid colors of yellow, orange, red, brown and green occur on a single plant. Wonderful to display in home or office. Basket with red roses, gerberas red, hypericum, feel green chrysanthemum and various grasses. 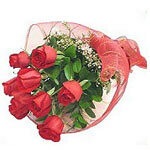 Send flowers to your loved ones in Athens, Greece and around the world. 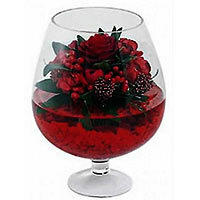 Includes long stemmed Red Roses accented with Baby's Breath. 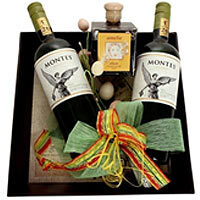 Flowers are hand-tied, and then shipped directly with your personal message.